Blue whale cartoon. Public domain . In Kazakhstan and Kyrgyzstan, a game played online that supposedly leads teenagers down a path to suicide has offered authorities a useful pretext to crack down on the internet. The game, which the governments of both countries refer to as “Blue Whale” (translation from Russian) is played in groups on the Russian Facebook equivalent Vkontakte. Supposedly, anonymous administrators of closed groups on the network use the service (as well as Whatsapp and Skype) to instruct players of the game to carry out specific tasks that include self-harm. After fifty days — in some documented cases — they are told to commit suicide. 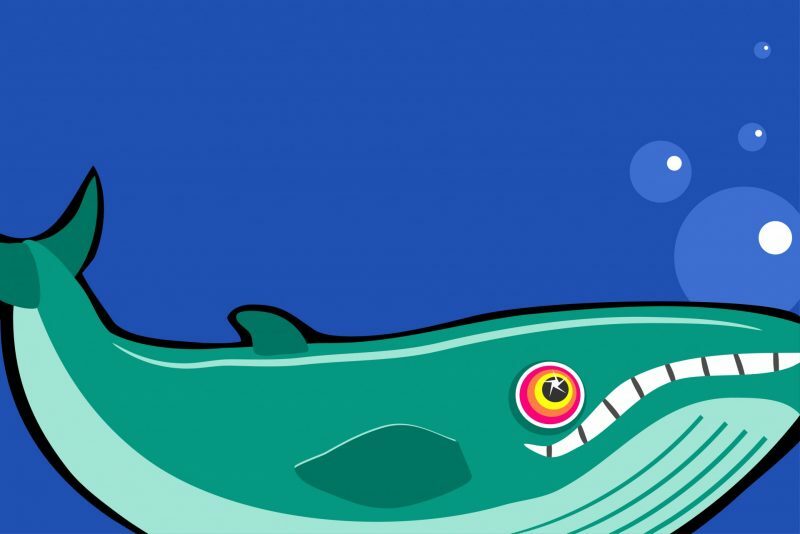 The hashtags for the game include #SeaOfWhales, #BlueWhales, #WhalesSwimUpwards and #WakeMeUpAt420. Whales appear to be used in branding for the game because, like dolphins, they have been known to die in circumstances that resemble suicide. Nevertheless, for all the panic that surrounds the groups, only one student  across both countries was thought to have potentially committed suicide as a direct result of them, and Kazakh police later ruled out the link. The game's sudden appearance in both countries raises questions. At the end of January, a number of outlets in Kyrgyzstan (with Russian government-owned Sputnik.kg taking the lead) published articles on the game's “arrival” in the country. One of Kazakhstan's government-backed television stations broadcast a report  on the game a day after the Sputnik report, with other Kazakh media outlets not picking up the thread until about a week later. In Kyrgyzstan, media reports on January 30, January 31 and February 1 mostly presented the game as a spreading virus infecting the country's schools. Some reports said the game had emerged towards the end of last year or at the turn of 2017, but there are few explanations as to why there was zero media coverage of it prior to January 30. Many parents have accused the government and the media of blowing up the threat. In Kazakhstan, the head of a parents’ association complained  on February 8 that the social menace posed by the game had been made much greater by the ever-growing hype surrounding it. In Russia itself, the game is “no longer trending ” by most accounts. The young man that Russian authorities view as its brainchild, Filip Budeikin, is facing jail for driving at least 15 teenagers to suicide. While a controversial Gazeta.ru report  on the so-called death groups or suicide groups Budeikin and others created attributed 130 deaths in Russia to their existence, that figure has been widely disputed. The court grants the request of the Almaty Nauryzbayskovi district prosecutor's office regarding the termination of activities and distribution through foreign media [using the term “foreign media” to refer to VKontakte] of products inclining children to suicide on the territory of the Republic of Kazakhstan. The court order only refers to the so-called “whale groups” or “death groups” at present, rather than VKontakte as a whole. In that case, the groups would probably need to be closed by VKontakte moderators at the government's request. The Kazakh government is clearly uncomfortable with its inability to decisively regulate content on VKontakte. On February 13, the country's interior minister called for tighter legislation regarding social networks: . This is how it should be: we should pass laws to obligate the owners [of social media] to keep all data on Kazakhstani users inside Kazakhstan, or obligate them to work in Kazakhstan via Kazakh [Internet Service] providers. Then there will be [control]. Kyrgyzstan's response has been more haphazard. 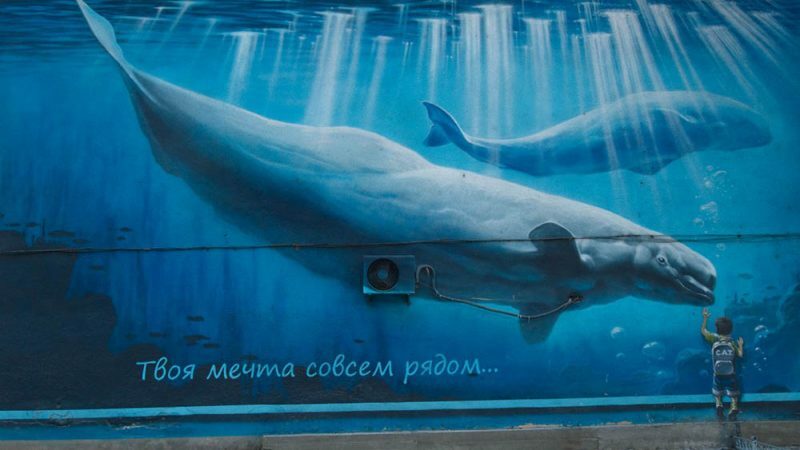 Shortly after news emerged of an underage suicide on February 1 that police later said was not connected to the game, police asked the owner of a travel agency to paint over a piece of street art he had commissioned — that also had no connection to the game — which featured a Beluga whale. Whale-themed street art in Bishkek that was painted over after panic surrounding the so-called ‘Blue Whale’ game erupted. Image from Kloop.kg, creative commons. They then raided schools, and, according to schoolchildren, checked students’ mobile phones for connections to the group. Most recently, the state committee on communications said that it would block social media users using hashtags associated with the game. To do, this, the committee acknowledged  on February 14, it will need Russia's help, given that VKontakte's servers are located there. We will send requests to our Roskomnadzor [Russian communications regulator] colleagues in Russia, as these hashtags are mainly used on the social network “VKontakte”, so that they might remove [these users] from their servers. Russia's state communications regulator, Roskomnadzor already censors media reporting on suicides  and has played an active role in shutting down the VKontakte “death groups” in Russia. These initiatives might be characterised as mere over-reactions if the governments of Central Asia did not have prior, long-running vendettas against social media. Kazakhstan is keen to clamp down on social media after it proved a useful tool for mobilising people in massive protests against the government last year . Under outgoing President Atambayev, Kyrgyzstan has actively targeted users of Facebook  critical of the head of state, calling several in for questioning. Both countries seem unwilling to block social media outright (except on rare occasions ), which might incur international criticism and rob them of a useful thermometer to gauge the public's political mood. What emerges instead is a piecemeal approach, in which certain subtexts provide incremental justifications for authorities in the two republics to place social media under greater scrutiny and include it in more legislation. Then, there is the regional setting. In February last year, an obscure group called the Organisation of Eurasian Cyber-Security  sent emails to media outlets in various ex-Soviet countries containing an appeal to leaders of the countries  to secure their “cyber-borders” and block, if necessary, websites such as YouTube and Facebook that could threaten political stability. One Kyrgyz media outlet made a faithful — but fruitless — attempt  to find out who or what the OECS was. The Knews.kg outlet noted the organisation's website had listed addresses in Moscow and the Kazakh city of Almaty that did not check out when tested, and that the website had been designed to look like that of the Collective Security Treaty Organisation, a multilateral military body led by Russia. Most outlets in Kyrgyzstan, Kazakhstan and Armenia made no fact-checking efforts and simply reprinted the sensational appeal. The website linked to the OECS has since disappeared . Similar to the recent, bubble-like emergence of the “blue whale” groups in Kyrgyzstan and Kazakhstan, no one can say for sure who was behind it.